This short circular walk starts from the attractive village of Dufton and follows the Pennine Way north before ascending Dufton Pike from where excellent views are reward for the effort required for the ascent. Dufton Pike takes a conical form when viewed from many directions and provides a convenient landmark in this part of the Vale of Eden. 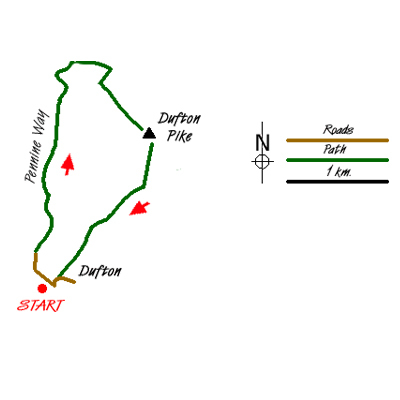 The start is the village of Dufton where there is small car park adjacent to the public conveniences (Grid ref. NY689250). Exit the car park and turn left and the follow the road through the village towards Knock. Just after the road turns right to leave the village take the farm track that forks right (Grid ref. NY 688 253). This leads north with the Pennine Way joining from the right to reach Coatsike Farm. Continue north on the Pennine Way (Hurning Lane) to Halsteads. Just beyond here the track descends to cross Great Runsdale Beck at a gate. Just before the gate take the right hand grassy path (Grid ref. NY692273). You soon enter “Open Access” at a wall. Just beyond here go half right and head for the path that can be seen on the hillside ahead. This leads without further problem to the summit of Dufton Pike. Because Dufton Pike is a solitary hill the views in all directions are worthwhile with the main Pennine ridge in view to the east and the Lakeland Fells visible across the Vale of Eden to the west. To continue descend by the clear path leaving the summit to the south-west. This leads down to a lane. Turn right and follow this track back to Dufton. Note – The ascent of Dufton Pike described above does not involve any trespass. However there is a more direct path that starts before open access countryside is reached but this is not a public right of way.